The 10-year-old who fell face-first from a treehouse while avoiding a swarm of attacking wasps, is expected to make a full recovery. 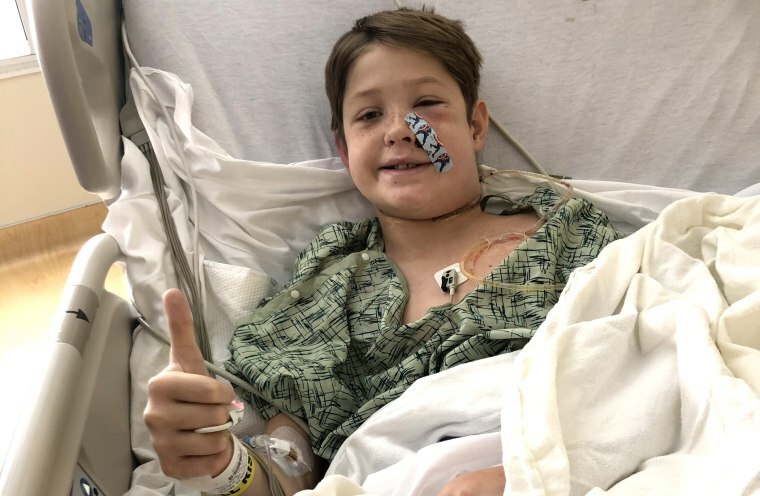 A 10-year-old Missouri boy whose skull was pierced with a meat skewer after he fell from a treehouse as he fought off a swarm of wasps is expected to make a full recovery in what his father described as a "miracle." Xavier Cunningham was playing with friends behind his Western Missouri house when a swarm of yellow jackets attacked them. Cunningham panicked, falling from the treehouse and face-first into a metal rotisserie skewer the boys had found and staked into the ground to avoid stepping on it, Cunningham's father, Shannon Miller, told NBC News. "He was more concerned with the yellow jackets than the skewer," Miller said. The skewer drove through Xavier's face, all the way to the back of his head. He then ran inside to his mother, who immediately brought him to the hospital. Xavier eventually ended up at the University of Kansas Hospital, where Dr. Koji Ebersole assessed the path of the skewer, which somehow circumvented Xavier's eyes, brain, and major blood vessels. "I was amazed that he was alive, let alone, awake and talking," Ebersole, the hospital's endovascular neurosurgery director, said in a video posted on The University of Kansas Health System's YouTube channel. Ebersol said the skewer somehow managed to nearly brush — but completely miss — two vital blood vessels when it bored through Xavier's head. The trajectory the rod went "is essentially one in a million," Ebersol said. "I just can't believe that." The unlikely path the skewer traveled allowed Ebersol the time to assemble a team of about 100 people and come up with a plan to remove it. But Xavier wasn't out of the woods just yet. The square skewer had a knob on the end of it, which could have still damaged those two vessels on the way out, Ebersol said. Additionally, the skewer had penetrated Xavier's jaw muscle, prohibiting him from opening his mouth for a breathing tube during surgery. The massive medical team devised a plan though, and were able to remove the skewer without any further damage. "The impressive thing about the story is how this thing could pass so deep through that part of the body and not hit something critical," Ebersol said. "I don’t know how the kid could be so lucky." Xavier is expected to be discharged from the hospital this week, his dad told NBC News. "He's back to his same ol' self. Looking forward to church, football and school," Miller said. "It’s nothing short of a miracle."